You can help improve the Sound’s water quality, get trash off your favorite beach, and restore vibrant life to your local rivers! Encourage your town, school, golf course, or club to reduce their fertilizer use. Help stop algae blooms and dead zones by eliminating or reducing fertilizer use. When purchasing fertilizer, look for the zero: a “0” in the middle of a label means it’s phosphorous free. This free brochure is a great guide to choosing Sound-friendly fertilizers. Instead of using commercial fertilizer, allow yard waste like leaves and grass to compost into valuable, nutrient-rich soil for lawns and gardens. Take care of the wastewater on your property—pump out your septic system every 3-5 years or have your sewer line inspected for cracks. Make the needed repairs to keep your system in good working order. If you see or smell sewage leaks or overflows, report it to local authorities and the Soundkeeper right away. Learn more about how to recognize and document sewage leaks. Be a considerate pet owner—never throw pet waste into storm drains or into rivers, streams, or coastal waters. Pet waste contains bacteria that can cause disease. Join a Save the Sound river or coastal cleanup. Removing trash and debris from your favorite beach or waterway protects wildlife, water quality, and beachgoers. 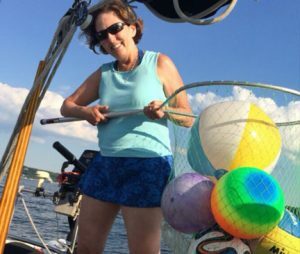 Be a responsible boater: never dump trash overboard! Recycle plastics and glass containers and keep them out of our waterways. Properly dispose of harmful chemicals, pharmaceuticals, and household grease and oil. Your municipal government can tell you where to drop off hazardous materials for safe disposal. 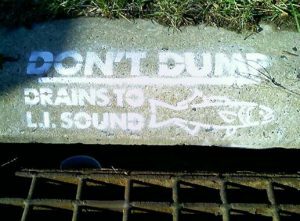 If you see illegal dumping into a storm drain or waterway, report it to local authorities and the Soundkeeper. Join us for riverbank volunteer plantings at dam removal sites or create a buffer of native plants along stream banks in your community or on your property. This prevents erosion, filters water flowing into rivers, and provides food and shelter for wildlife. Help Save the Sound fill a rain garden or bioswale near you with native plants that will filter pollutants out of stormwater naturally, help prevent flooding…and look beautiful while doing it. 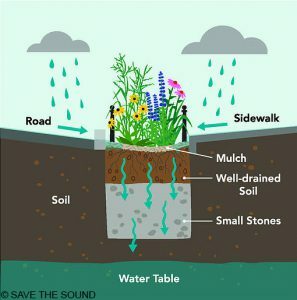 Check out our dedicated green infrastructure site at www.reducerunoff.org for a huge set of inspiring resources—including how to install your very own rain garden at home! Watch your water use at home—get leaks fixed, turn off taps when you’re not using them, and consider installing a rain barrel to collect rainfall for watering your garden or washing your car. Managing drinking water is critical for human health. Check out our new Connecticut State Water Plan website, developed in partnership with Rivers Alliance, to learn how Connecticut’s plan for managing public drinking water, industrial water use, and rivers will affect your community.